New York City  The Ukrainian Museum will open to the public in its newly constructed, $9 million, 25,000-sq.-ft. building on April 3, 2005. 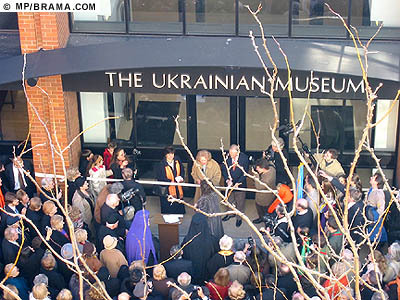 2/6/05 - Cutting the ribbon during the christening of the new Ukrainian Museum at 222 East 6th Street in New York. The three-story brick and glass structure located at 222 East 6th Street in the East Village district of Manhattan will become the new home of the Museum, which has served its constituency as part of New York City's cultural community for over twenty-eight years. Designed by George Sawicki of the New York-based architectural firm SawickiTarella Architecture+Design and constructed by S. DiGiacomo & Son, the building includes spacious galleries, state-of-the-art collections storage facility, an auditorium, a library, a gift shop, and a café. The new Ukrainian Museum building represents the culmination of a decade-long project that has benefited from unwavering community support and signals a new phase of activities for the institution, that will include expanded programming in exhibitions, an educational agenda, and community-oriented cultural events. The Museum's extensive collections of Ukrainian folk art, fine art, and photographic/documentary archives will continue to serve as the major sources for program development. An exhibition of the works of Ukrainian sculptor Alexander Archipenko - one of the 20th century's most innovative and influential artists, will inaugurate the new Museum building. The exhibit entitled Alexander Archipenko: Vision and Continuity will include some 65 sculptures and sculpto-paintings, the majority on loan from the personal collection of Frances Archipenko Gray, the artist's widow, supplemented by works from private and museum collections. The exhibition is curated by Dr. Jaroslaw Leshko, Professor Emeritus of Art History at Smith College in Northampton, MA. An illustrated, bilingual (English and Ukrainian) catalogue will accompany the exhibition, as will public programs such as a lecture series, a symposium, and gallery talks. A full range of educational material for teachers, students and families will augment the exhibition. After completing its run at The Ukrainian Museum, the exhibition is scheduled to travel to the Elvehjem Museum in Madison, WI (March 31 to July 30, 2006) and to Smith College of Art, Northampton, MA. (September 16 to December 3, 2006).